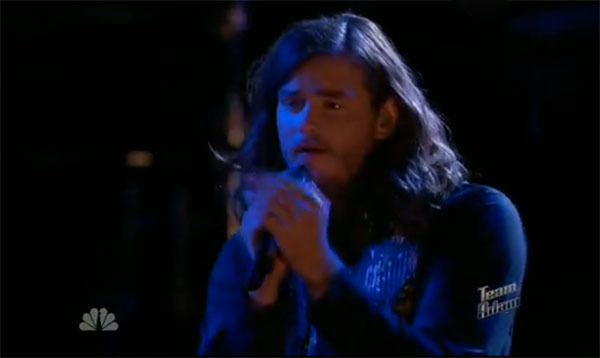 Blaine Mitchell from Team Adam sings ‘Never Tear Us Apart’ on The Voice Season 9 Live Playoffs, Monday, November 9, 2015. “It’s cool when you see an a country artist with a rock coach. It’s the perfect combination,” said Blake Shelton. “That was the right song choice for you. It’s a song that gave you all the room for everyone to see a good performance. That’s a signature of a great performance, ” said Pharrell Williams. “What I love about you is your body language, its crazy. No one can teach you that,” said Gwen Stefani. “It’s so cool when you have a vision like that and you get to see it through. You’re exactly where you needed to be,” said Adam Levine.